Ultimate video converting and editing software for you! Xilisoft Video Converter Ultimate gives you all the capabilities to create high-quality files respectively from your favorite videos, audios and pictures. No matter working in 2D or 3D, Standard-Definition or High-Definition, you can do the video convert like a professional: easily convert standard videos to 3D videos or 3D videos to other kinds of 3D videos, convert WMV to AVI as WMV converter, convert AVI files to MPEG, convert MPEG-4, AVI, H.264/AVC, DivX, XviD, RM, FLV, SWF, MOV, 3GP, WMV, MP3, AAC, AC3, M4A, WAV, WMA and more video/audio formats from one to another, pick out pictures you favor from videos, create fantastic video from pictures. Xilisoft Video Converter Ultimate is far more than WMV converter. With it, producing fabulous video with special effects is also effortless: crop video size, edit effects, add watermark/subtitles/soundtracks, clip and merge any segment to get personalized video. 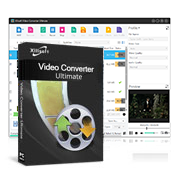 Download Xilisoft Video Converter Ultimate to ease your video convert job, and show off your amazing conversion on iPod, iPad, iPhone, PSP or cell phone now! Supports iPhone 6, iPhone 6 Plus, iPhone 5, iPhone 5S, iPhone 5C, iPod touch 5 and iPod Nano 7. Modified profile parameters and additional codecs are provided for enhanced quality on compatible devices. Add profile for wii and NDS device. Add recommended profile on each category, easy to choose the most popular profile. Add decode for JVC Video Disk Camera to original: JVC Recorded Video File(*.mod). Xilisoft Video Converter is capable of converting among different type of 3D videos. A few clicks to convert video formats including convert MPEG-4, convert AVI, H.264/AVC, DivX, Xvid, RM, FLV, SWF, MOV, 3GP, WMV, etc., e.g. convert WMV to AVI as WMV converter, convert AVI files to MPEG. Xilisoft Video Converter has complete support of High-Definition (HD) video encoding and decoding. Create slideshow-like videos from your picture collection in BMP, GIF, JPEG or PNG format; pictures shot by digital camera are also supported. Xilisoft Video Converter Ultimate highly supports APE and CUE decoding. With Xilisoft Video Converter Ultimate, you can take snapshot singly to catch any frame you love. Enjoy your animated photos on your digital devices anytime and anywhere. Add picture or text watermark to mark videos with your style. Set multiple formats for converting video simultaneously from the same source for output to save more time. Compare source video and edited video to view the effect distinctly. Customized: any profile can be customized to help you create profile for later use. Various skins options are provided for you to change product appearance at will.